IN THIS PLACE, ON 23 MAY 1498, FRA GIROLAMO SAVONAROLA WAS HANGED AND THEN BURNED AFTER AN INIQUITOUS VERDICT, IN THE COMPANY OF HIS FELLOWS FRA DOMENICO BUONVICINI AND FRA SILVESTRO MARUFFI. THIS MEMORIAL WAS PUT IN PLACE FOUR CENTURIES LATER. QUI / DOVE CON I SUOI / CONFRATELLI FRA DOMENICO / BUONVICINI E FRA SILVESTRO / MARUFFI IL XXIII MAGGIO / DEL MCCCCXCVIII PER INIQUA / SENTENZA FU IMPICCATO ED ARSO / FRA GIROLAMO SAVONAROLA / DOPO QUATTRO SECOLI / FU COLLOCATA QUESTA / MEMORIA. History is habitually written by the victors. Or - in the present case - by Florentine nostalgists with a Catholic reformist agenda. Four Centuries - plus a hundred and thirteen years later - history is habitually written by SEARCH ENGINES. AND FINALLY, a normal day in Piazza della Signoria - with nobody taking any notice. 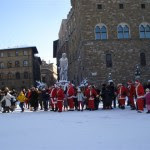 PHOTOGRAPHS: (1) Piazza della Signoria © Lyle Goldberg, (2) Florence, Museo di San Marco, (3), (4), (5) from the web, and (6) Piazza della Signoria © Lyle Goldberg. Brilliant, brilliant....just loved this. And, as always, I have had a nice chuckle (what a strange word). I can't decide which post I love most because each new one I check out is more witty, and more clever than the last. This was great!!! !